If you are a facility manager, then you must know the problems that come along with managing the hundreds and sometimes even thousands of visitors pouring into your premises on a daily basis. Touchpoint multi-tenancy visitor management system solves that problem. It effectively streamlines the process for maximum productivity by entirely digitizing the outdated system of pen and paper. By employing TouchPoint's multi-tenancy VMS, facility manager can easily eliminate the long queues that damage the image of the facility, fasten up the multiple registrations process, control resources better to allow security guards to carry out their primary tasks, and eventually fortify the security of the premises. Security is the most important reason why anyone wants a visitor management system in the first place. In a multi-tenancy facility, the concern for security is only multi-fold due to the sheer number of visitors on a daily basis. No person can enter the facility without going through a proper background check. Every single person in the facility is accounted for and can be contacted instantly in case of an emergency. Over staying visitors can be alerted through the system and thus avoid any problems. With facilities around the country more concerned about their image and reputation, and to achieve the international standards in service, it is only natural that they facilitate the entry process as easy and quick as possible. Repeat visitors who are registered into the system already need not wait anymore. VIP visitors will be duly respected as they are meant to be, thus avoiding any potential problems and losing time. The absence of a long queue will improve the overall image of the facility. For a multi-tenant facility manager the Tenant is the king; they bring in the money. That is why it is necessary to give them complete control over who can visit them and who cannot. TouchPoint's Tenant Portal makes this possible and much more. With Tenant portals all appointments are pre-registered. The Tenants have full control over who can get inside their building. Pre-registration will help streamline the process much better than manual registration. Communication between the facility security team, the tenant, and the visitor is of paramount importance to have a smooth welcoming process for the visitor. 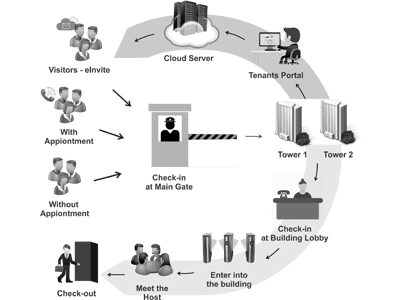 TouchPoint provides the involved parties with separate portals to ensure the same. With a digital system, communication process is much easier and direct. The tenant can directly connect with the incoming visitors through tenant portal. The tenant's communication with the security team is no more via emails but through the portal.